These highlights do not include all the information needed to use Zorcaine â„¢ï»¿safely and effectively. See full prescribing information for Zorcaineâ„¢. Children 4-16 years: 7 mg/kg (0.175 mL/kg), depending on the age, weight and magnitude of the operation. To report SUSPECTED ADVERSE REACTIONS, contact Septodont at 1-800-872-8305 or FDA at 1-800-FDA-1088 or www.fda.gov/medwatch. ZorcaineTM, an amide local anesthetic containing a vasoconstrictor, is indicated for local, infiltrative, or conductive anesthesia in both simple and complex dental procedures. Table 1 (below) summarizes the recommended volumes and concentrations of Zorcaine for various types of anesthetic procedures. The dosages suggested in this table are for normal healthy adults, administered by submucosal infiltration or nerve block. For most routine dental procedures, articaine hydrochloride 4% containing epinephrine 1:200,000 is preferred. However, when more pronounced hemostasis or improved visualization of the surgical field are required, Zorcaine containing epinephrine 1:100,000 may be used. Pediatric Patients Ages 4 to 16 Years: The quantity of articaine HCl in children ages 4 to 16 years of age to be injected should be determined by the age and weight of the child and the magnitude of the operation. The maximum dose of articaine HCl 4% should not exceed 7 mg/kg (0.175 mL/kg) [see Use in Specific Populations (8.4)]. Safety and effectiveness of Zorcaine in pediatric patients below the age of 4 years have not been established. Zorcaine is contraindicated in patients who are hypersensitive to products containing sulfites. Products containing sulfites may cause allergic-type reactions including anaphylactic symptoms and life-threatening or less severe asthmatic episodes in certain susceptible people. Sulfite sensitivity is seen more frequently in asthmatic than in non-asthmatic people [see Warnings and Precautions (5.5)]. Accidental intravascular injection of Zorcaine may be associated with convulsions, followed by central nervous system or cardiorespiratory depression and coma, progressing ultimately to respiratory arrest. Dental practitioners who employ local anesthetic agents including Zorcaine should be well versed in diagnosis and management of emergencies that may arise from their use. Resuscitative equipment, oxygen, and other resuscitative drugs should be available for immediate use. To avoid intravascular injection, aspiration should be performed before Zorcaine is injected. The needle must be repositioned until no return of blood can be elicited by aspiration. Note, however, that the absence of blood in the syringe does not guarantee that intravascular injection has been avoided. This includes toxicity arising from accidental intravascular injection of Zorcaineâ„¢ discussed in Section 5.1, as well as that related to higher systemic concentrations of local anesthetics or epinephrine [see Warnings and Precautions (5.3)]. Systemic absorption of local anesthetics including Zorcaineâ„¢ can produce effects on the central nervous and cardiovascular systems. At blood concentrations achieved with therapeutic doses of Zorcaine changes in cardiac conduction, excitability, refractoriness, contractility, and peripheral vascular resistance are minimal. However, toxic blood concentrations of Zorcaine can depress cardiac conduction and excitability, which may lead to atrioventricular block, ventricular arrhythmias, and cardiac arrest, possibly resulting in fatalities. In addition, myocardial contractility is depressed and peripheral vasodilatation occurs, leading to decreased cardiac output and arterial blood pressure. Zorcaine should also be used with caution in patients with heart block as well as those with impaired cardiovascular function since they may be less able to compensate for functional changes associated with the prolongation of A-V conduction produced by these drugs. Careful and constant monitoring of cardiovascular and respiratory (adequacy of ventilation) vital signs and the patient's state of consciousness should be performed after each local anesthetic injection of Zorcaine Repeated doses of Zorcaine may cause significant increases in blood levels because of possible accumulation of the drug or its metabolites. The lowest dosage that results in effective anesthesia should be used to decrease the risk of high plasma levels and serious adverse effects. Tolerance to elevated blood levels varies with the status of the patient. Resuscitative equipment, oxygen, and other resuscitative drugs should be available for immediate use. Precautions for epinephrine administration, discussed in Section 5.3, should be observed. Debilitated patients, elderly patients, acutely ill patients, and pediatric patients should be given reduced doses commensurate with their age and physical condition [see Dosage and Administration (2.1, 2.3)]. No studies have been performed in patients with liver dysfunction, and caution should be used in patients with severe hepatic disease. Zorcaine contains epinephrine, a vasoconstrictor that can cause local or systemic toxicity and should be used cautiously. Local toxicity may include ischemic injury or necrosis, which may be related to vascular spasm. 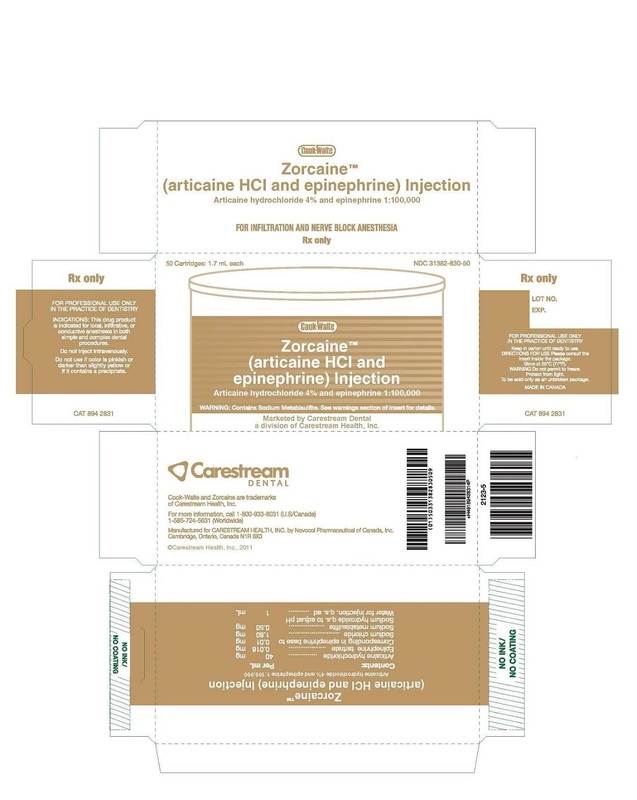 Zorcaine should be used with caution in patients during and following the administration of potent general anesthetic agents, since cardiac arrhythmias may occur under such conditions. Patients with peripheral vascular disease and those with hypertensive vascular disease may exhibit exaggerated vasoconstrictor response. Articaine, like other local anesthetics, can cause methemoglobinemia, particularly in conjunction with methemoglobin-inducing agents. Zorcaineâ„¢ should not be used in patients with congenital or idiopathic methemoglobinemia, or in patients who are receiving treatment with methemoglobin-inducing agents since they are more susceptible to drug-induced methemoglobinemia. Signs and symptoms of methemoglobinemia may be delayed some hours after exposure. Initial signs and symptoms of methemoglobinemia include slate grey cyanosis seen in buccal mucous membranes, lips, and nail beds. In severe cases, symptoms may include central cyanosis, headache, lethargy, dizziness, fatigue, syncope, dyspnea, CNS depression, seizures, dysrythmia, and shock. Methemoglobinemia should be considered if central cyanosis unresponsive to oxygen therapy occurs, especially if methemoglobin-inducing agents have been used. Calculated oxygen saturation and pulse oximetry are inaccurate in the setting of methemoglobinemia. The diagnosis can be confirmed by an elevated methemoglobin level of at least 10% is present. The development of methemoglobinemia is dose-related. Management of methemoglobinemia: If methemoglobinemia does not respond to administration of oxygen, clinically significant symptoms of methemoglobinemia should be treated with administration of a slow intravenous injection (over 5 minutes) of methylene blue at a dosage of 1-2 mg/kg body weight. Zorcaine contains sodium metabisulfite, a sulfite that may cause allergic-type reactions including anaphylactic symptoms and life-threatening or less severe asthmatic episodes in certain susceptible people. The overall prevalence of sulfite sensitivity in the general population is unknown. Sulfite sensitivity is seen more frequently in asthmatic than in non-asthmatic people. The reported adverse reactions are derived from clinical trials in the United States and the United Kingdom. Table 2 displays the adverse reactions reported in clinical trials where 882 individuals were exposed to ZorcaineTM containing epinephrine 1:100,000. Table 3 displays the adverse reactions reported in clinical trials where 182 individuals were exposed to ZorcaineTM containing epinephrine 1:100,000 and 179 individuals were exposed to articaine hydrochloride 4% containing epinephrine 1:200,000. The following adverse reactions have been identified during postapproval use of ZorcaineTM. Because these reactions are reported voluntarily from a population of uncertain size, it is not always possible to reliably estimate their frequency or establish a casual relationship to drug exposure. The administration of local anesthetic solutions containing epinephrine to patients receiving monoamine oxidase inhibitors, nonselective beta-adrenergic antagonists, or tricyclic antidepressants may produce severe, prolonged hypertension. Phenothiazines and butyrophenones may reduce or reverse the pressor effect of epinephrine. Concurrent use of these agents should be avoided; however, in situations when concurrent therapy is necessary, careful patient monitoring is essential [see Warnings and Precautions (5.2)]. There are no adequate and well-controlled studies in pregnant women with Zorcaine. Articaine hydrochloride and epinephrine (1:100,000) has been shown to increase fetal deaths and skeletal variations in rabbits when given in doses approximately 4 times the maximum recommended human dose (MRHD). Zorcaine should be used during pregnancy only if the potential benefit justifies the potential risk to the fetus. It is not known whether Zorcaine is excreted in human milk. Because many drugs are excreted in human milk, caution should be exercised when Zorcaine is administered to a nursing woman. When using Zorcaine, nursing mothers may choose to pump and discard breast milk for approximately 4 hours (based on plasma half life) following an injection of Zorcaine (to minimize infant ingestion) and then resume breastfeeding. Safety and effectiveness of Zorcaine in pediatric patients below the age of 4 years have not been established. Safety of doses greater than 7 mg/kg (0.175 mL/kg) in pediatric patients has not been established. Safety and effectiveness was established in clinical trials with 61 pediatric patients between the ages of 4 and 16 years administered articaine hydrochloride 4% and epinephrine 1:100,000 injections. Fifty-one of these patients received doses from 0.76 mg/kg to 5.65 mg/kg (0.9 to 5.1 mL) for simple dental procedures and 10 patients received doses between 0.37 mg/kg and 7.48 mg/kg (0.7 to 3.9 mL) for complex dental procedures. Approximately 13% of these pediatric patients required additional injections of anesthetic for complete anesthesia. Dosages in pediatric patients should be reduced, commensurate with age, body weight, and physical condition [see Dosage and Administration (2.2)]. In clinical trials, 54 patients between the ages of 65 and 75 years, and 11 patients 75 years and over received Zorcaine containing epinephrine 1:100,000. Among all patients between 65 and 75 years, doses from 0.43 mg/kg to 4.76 mg/kg (0.9 to 11.9 mL) were administered to 35 patients for simple procedures and doses from 1.05 mg/kg to 4.27 mg/kg (1.3 to 6.8 mL) were administered to 19 patients for complex procedures. Among the 11 patients â‰¥ 75 years old, doses from 0.78 mg/kg to 4.76 mg/kg (1.3 to 11.9 mL) were administered to 7 patients for simple procedures and doses of 1.12 mg/kg to 2.17 mg/kg (1.3 to 5.1 mL) were administered to 4 patients for complex procedures. No studies have been performed with articaine hydrochloride 4% and epinephrine 1:200,000 injection or articaine hydrochloride 4% and epinephrine 1:100,000 injection in patients with renal or hepatic dysfunction [see Warnings and Precautions (5.2)]. Zorcaineâ„¢ contains articaine HCl (40 mg/mL), epinephrine 1:100,000 (as epinephrine bitartrate), sodium chloride (1.6 mg/mL), and sodium metabisulfite (0.5 mg/mL). The product is formulated with a 15% overage of epinephrine. The pH is adjusted with sodium hydroxide. The onset of anesthesia has been shown to be within 1 to 9 minutes of injection of Zorcaine Complete anesthesia lasts approximately 1 hour for infiltrations and up to approximately 2 hours for nerve block. Administration of Zorcaine results in a 3- to 5-fold increase in plasma epinephrine concentrations compared to baseline; however, in healthy adults it does not appear to be associated with marked increases in blood pressure or heart rate, except in the case of accidental intravascular injection [see Warnings and Precautions (5.1)]. Absorption: Following dental injection by the submucosal route of an articaine solution containing epinephrine 1:200,000, articaine reaches peak blood concentration about 25 minutes after a single dose injection and 48 minutes after three doses. Peak plasma levels of articaine achieved after 68 and 204 mg doses are 385 and 900 ng/mL, respectively. Following intraoral administration of a near maximum dose of 476 mg, articaine reaches peak blood concentrations of 2037 and 2145 ng/mL for articaine solution containing epinephrine 1:100,000 and 1:200,000, respectively, approximately 22 minutes post-dose. 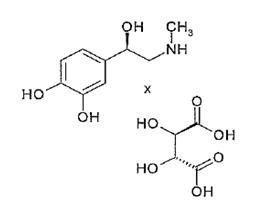 Distribution: Approximately 60 to 80% of articaine HCl is bound to human serum albumin and Î³-globulins at 37°C in vitro. Special Populations: No studies have been performed to evaluate the pharmacokinetics of Zorcaine injection in pediatric subjects. There is insufficient information to determine whether the pharmacokinetics of Zorcaine injection differs by race. Three randomized, double-blind, active-controlled studies were designed to evaluate effectiveness of Zorcaineâ„¢ containing epinephrine 1:100,000 as a dental anesthetic. Patients ranging in age from 4 years to over 65 years old underwent simple dental procedures such as single uncomplicated extractions, routine operative procedures, single apical resections, and single crown procedures, or complex dental procedures such as multiple extractions, multiple crowns and/or bridge procedures, multiple apical resections, alveolectomies, muco-gingival operations, and other surgical procedures on the bone. Zorcaineâ„¢ containing epinephrine 1:100,000 was administered as submucosal infiltration and/or nerve block. Efficacy was measured immediately following the procedure by having the patient and investigator rate the patientâ€™s procedural pain using a 10 cm visual analog scale (VAS), in which a score of zero represented no pain and a score of 10 represented the worst pain imaginable. Mean patient and investigator VAS pain scores were 0.3-0.4 cm for simple procedures and 0.5-0.6 cm for complex procedures. Four randomized, double-blind, active-controlled studies were performed comparing Zorcaineâ„¢ containing epinephrine 1:100,000 versus articaine hydrochloride 4% containing epinephrine 1:200,000. The first two studies used electric pulp testers (EPT) to evaluate the success rate (maximum EPT value within 10 minutes), onset, and duration of Zorcaineâ„¢ containing epinephrine 1:100,000 versus articaine hydrochloride 4% containing epinephrine 1:200,000 and articaine solution without epinephrine in healthy adults between 18 and 65 years old. Results indicated that the anesthetic characteristics of the 1:100,000 and 1:200,000 formulations are not significantly different. A third study compared the difference in visualization of the surgical field after administration of Zorcaineâ„¢ containing epinephrine 1:100,000 versus articaine hydrochloride 4% containing epinephrine 1:200,000 during bilateral maxillary periodontal surgeries in patients ranging from 21 to 65 years old. Zorcaineâ„¢ containing epinephrine 1:100,000 provided better visualization of the surgical field and less blood loss during the procedures. In a fourth study, designed to assess and compare cardiovascular safety, when the maximum dose of each formulation was administered, no clinically relevant differences in blood pressure or heart rate between formulations were observed. Inform patients in advance of the possibility of temporary loss of sensation and muscle function following infiltration and nerve block injections [see Adverse Reactions (6.2)]. Cook-Waite and Zorcaine are a trademarks of Carestream Health, Inc. WARNING: Contains Sodium Metabisulfite. See warnings section of insert for details. Marketed by Carestream Dental a division of Carestream Health, Inc.